by likemotherlikedaughterfoodblog in Main, Recipes, Side Dish Tags: dish, easy, macadamia nut pesto, macademia, main, nut, pasta, pesto, recipe, side, vegan, vegan pesto, vegetarian, whole wheat pasta, whole wheat. 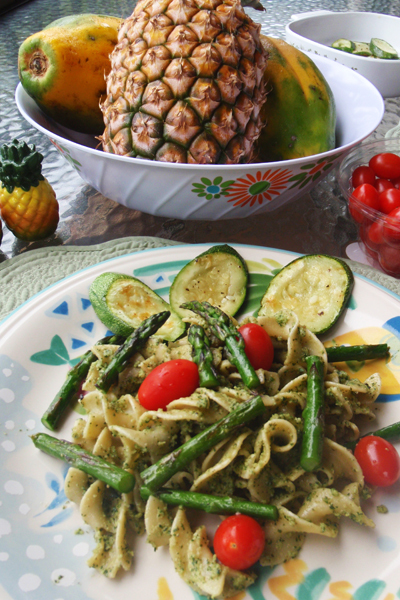 With macadamia nuts instead of pine nuts you can add a tasty island twist to a traditional pesto pasta recipe. 1. Cook pasta in a large pot of salted boiling water. Drain the pasta when it’s done. 2. Wash the asparagus, snap off the ends and discard. Wash and thinly slice the zucchini. Top the vegetables with a drizzle of olive oil, salt and pepper. Grill for 7 minutes, or broil for 10 minutes. 3. In the meantime, pulse the macadamia nuts in a food processor, then add garlic and basil and pulse a few times more. Slowly add the olive oil while the food processor is on. Scrape the sides of the food processor with the rubber spatula, add salt and pepper and pulse a few more times. 4. 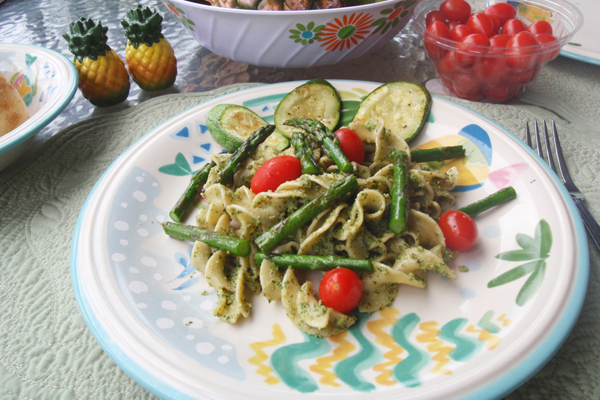 In a large bowl, mix pesto mixture and cooked pasta. 5. 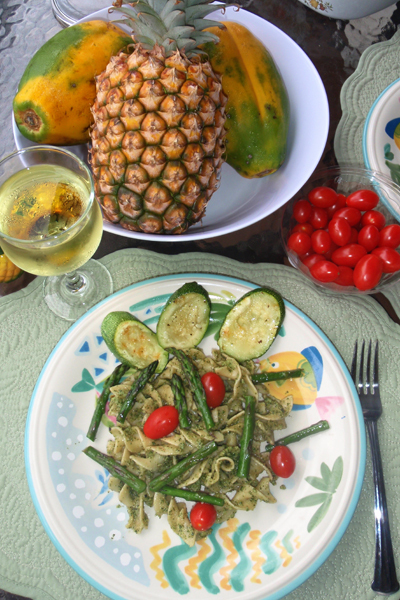 Cut up grilled asparagus and zucchini and add to the pasta. 6. Garnish with grape tomatoes and serve.